CLIMATE change is altering the face of the Himalayas, devastating farming communities and making Mount Everest increasingly treacherous to climb, some of the world’s top mountaineers have warned. Apa Sherpa, the Nepali climber who has conquered Mount Everest a record 21 times, said he was disturbed by the lack of snow on the world’s highest peak, caused by rising temperatures. 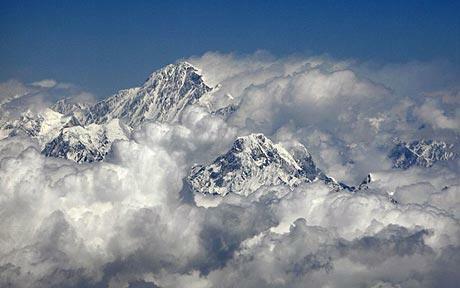 “In 1989 when I first climbed Everest there was a lot of snow and ice but now most of it has just become bare rock. That, as a result, is causing more rockfalls which is a danger to the climbers,” he said. Speaking after completing the first third of a gruelling 1,700-kilometre trek across the Himalayas, Apa Sherpa would not rule out the possibility of Everest being unclimbable in the coming years. “What will happen in the future I cannot say but this much I can say from my own experiences — it has changed a lot,” he said an an interview with AFP in the village of Gati, 16 kilometres from Nepal’s border with Tibet. The 51-year-old father-of-three, dubbed “Super Sherpa”, began his working life as a farmer but turned to the tourism industry and mountaineering after he lost all his possessions when a glacial lake burst in 1985. Mount Everest is becoming increasingly dangerous to climb because global warming is melting glacier ice along its slopes, according to a Nepalese Sherpa who has conquered the world’s highest summit 20 times [one less than above – Ed]. Rising temperatures have melted much of the ice on the steep trail to the summit and climbers are struggling to get traction on the exposed rock surface, according to the 49-year-old[two less than above – Ed] Sherpa, known only as Apa. The melting ice has also exposed deep crevasses which climbers could fall into, and experts have warned that people scaling the mountain risk being swept away by “outburst floods” from rising volumes of glacial meltwater. Could this possibly be the same Apa who, just four days ago, dedicated his climb with 13 year old American Jordan Romero to the impact of climate change on the Himalayas, a fact not even mentioned in the Telegraph report? Obviously an impartial assessment, then. Add it to the warmlist. Global warming is such a non-story, the media is now reduced to recycling yesterday’s fish and chip wrappers. Is there a snow melt cam lookin up Everest so everyone can see, don’t worry.. the snow is still there. Hopefully we can arrange our solar panels and windmills just right so that the climbing difficulty of Everest can return to it’s rightful value. Simon, you forgot to mention that Apa Sherpa is also a WWF Climate Ambassador … and let’s not forget the sponsorship deals. Oh, and this one too. He might be a great mountaineer, but he’s sold his soul to the highest bidders! If its so warm up there then surely he can climb the summit without a coat right? While we’re at it, why don’t we examine the damage crap left behind by the mountain by climbers themselves. It’s called erosion, and has happened to every mountain range since the world was formed. Tectonic activity puts ’em up, and erosion knocks ’em down.